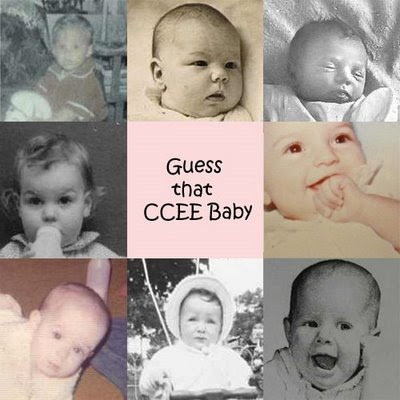 CCEE Stampers: Guess That CCEE Baby ... The Answers! Guess That CCEE Baby ... The Answers! Well this has been sooooo much fun reading everyone's guesses LOL ... so far no one has guessed them 100%. Even the other CCEE members have been stumped on this one. Seeing most of you used the photo collage I created above to give your guesses, I will use that too to give you the answers. This one had me stumped for a while ... trying to work out what you all meant by top, middle and bottom row LOL .... I thought you were seeing the blog post somehow differently then I was ... and then when I received an email from a fellow CCEE member and she did the same thing ... the penny dropped!!!!!! Anyway I have kept you all in suspense for sooooo long I am sure you want to know who is who ... if you don't those CCEE girls sure do. I will update the previous blog post shortly with links to our blog posts so that you can read our comments on this challenge if you so wish. Don't forget that if you want to be in the running for the prize for this challenge to leave a comment on this post before midnight 17th January. So how did you go????????? Well, your baby pictures may have stumped me since I only got 3 out of 8 right and one of those 3 was me! Snort! BUT, I was paying attention to whether or not you followed rules so don't think you pulled one over on me! You are all on probation! So you better get it right next Monday. Can anyone send me a copy of the rules that I put in place for next week??? I can't remember them, darn CRS! By the way, that's what happened with the ribbon this week! Thanks for making this so fun guys despite your groaning and moaning! Giggle! Are baby pictures not the most fun? I think I got at least two right. woo hoo! I got 5 out of 8! Again I loved all of the LO"s.. It makes me wanna get my baby pictures out and scrap them! This was fun. I only had 2 right. So that's better then ZERO! I only got Cindy M, Deb and Frances right I think!